John D. Murray has been named dean of the College of Arts and Sciences at Indiana State University. Murray is professor and chair of the psychology department at Georgia Southern University. He will begin his duties at Indiana State July 1, succeeding Tom Sauer who is retiring. "John Murray's experience, leadership skills and strong human relations skills are most impressive. He is an outstanding researcher, committed educator and successful academic leader. I am confident that he has the skills to be an outstanding dean and that he is fully committed to advancing the mission of our College of Arts and Sciences and university," said C. Jack Maynard, ISU's provost and vice president for academic affairs. "I am quite happy and honored to be able to serve the college and Indiana State. ISU is a great place," Murray said. "I like the size of the institution and the composition of the departments. The faculty and programs are strong. It looks like a good fit for me professionally and we're looking forward to joining the Sycamore family." The College of Arts and Sciences is the largest of Indiana State's six colleges. About one-third of ISU's 10,500 students are pursuing majors in the college, which is home to 19 academic departments and more than 230 faculty members in the arts, humanities, social sciences and natural sciences. "The search committee is very pleased with the outcome and especially excited that Dr. Murray has agreed to serve and lead the College of Arts and Sciences," said Jay Gatrell, dean of ISU's College of Graduate and Professional Programs. Gatrell, who is also associate professor of geography in the College of Arts and Sciences, chaired the search committee that reviewed an international pool of 60 candidates before recommending Murray for the position. "Dr. Murray has been an active member of the community and clearly understands the importance of engaging the community and developing new partnerships," Gatrell said. Murray is an experimental psychologist by training and has been a faculty member at Georgia Southern since 1993. He has served as chair of the psychology department since 2005. As department chair, he provides leadership for the activities of 16 tenure track faculty, one temporary instructor and eleven full-time staff members. He also oversees the activities of a community psychology clinic and the Georgia Southern Regents Center for Learning Disorders. Murray led efforts to establish a doctoral program in clinical psychology as well as a psychology clinic that serves several rural counties and provides training for students. He also serves as rural health coordinator for the Georgia Psychological Association and as an ambassador for the National Health Service Corps. 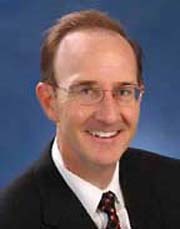 In addition to his work at Georgia Southern, Murray has served in faculty positions at the University of Florida and Georgia Institute of Technology. He holds a bachelor's degree in psychology from Purdue University and a Ph. D. from the University of California, Santa Barbara. He completed postdoctoral studies at the University of Massachusetts Amherst. Originally from New Jersey, Murray's family moved to Indiana in 1969. He is a 1980 graduate of Pike High School in Indianapolis. Murray's wife Rebecca is a clinical psychologist and the Murrays have a 9-year-old daughter.